Soon after 1900 a prominent fashion magazine called Vogue published a coupon for a pattern. For fifty cents, the reader received a pattern hand-cut by the designer Mrs. Payne on her dining-room table. While Vogue was using its publishing power to spawn a fashion pattern business, the other sewing pattern companies did not slow down. Here are some notable moments — and collectible names — in sewing pattern history. In 1902, James McCall’s The Queen of Fashion magazine changed its name again and became McCall’s Magazine, widening the contents of the publication to other womanly pursuits and interests. In 1910, Butterick continued their sewing pattern industry innovation by introducing the “deltor” — the first instructions printed on a sheet included inside the pattern’s envelope. In 1914, the Vogue pattern department officially left the magazine to become Vogue Pattern Company. (This was in no small part due to the 1909 purchase of Vogue by Condé Nast.) Vogue patterns continued to be sold by mail until 1917, when B. Altman’s department store in New York City became the first store to stock their patterns. In May of 1920, Vogue Patterns launches the Vogue Pattern Book. In 1920, there was another major change in the sewing pattern industry. This time it was McCall’s leading the way by moving from the perforated tissue patterns to printed ones. Eventually the others would follow suit. McCall’s would also begin working with designers like Lanvin, Mainbocher, Patou, and Schiaparelli. An advertising salesman for fashion magazine Fashionable Dress, Joseph M. Shapiro, was shocked to find that something consisting mainly of tissue paper would cost $1. Via his connections, he found the way to produce — and profit from — a pattern which would sell for just 15 cents. The Simplicity Pattern Company was born in 1927 and Joseph’s son, James J. Shapiro, was its first president. With such a low price, Simplicity expanded quickly, including internationally. In 1931, Vogue starts Couturier Line and introduces new large format envelopes. In 1931, Simplicity began producing DuBarry patterns exclusively for F. W. Woolworth Company (through 1940). In 1932, Condé Nast starts the Hollywood Pattern Company. Hollywood Patterns featured designs straight of film and usually had photos of Hollywood stars on the packaging as well. The Hollywood Pattern Company ceased pattern production a few years after the end of World War II. Also in 1932, McCall’s would again push the envelope by, well, pushing the envelope — now full-color illustrations appeared on the covers of McCall’s pattern envelopes. 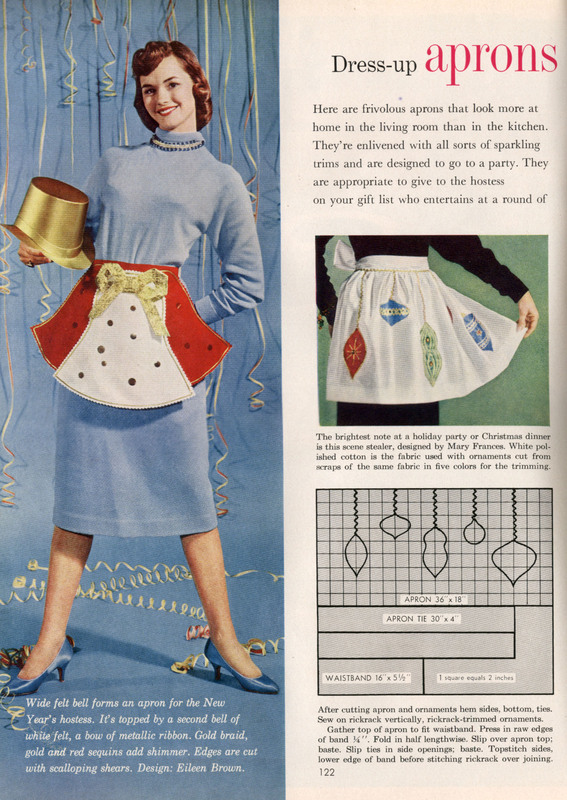 In 1946, Simplicity finally fully converts from perforated patterns to printed sewing patterns. In 1949, Vogue added the Paris Original Models patterns from French Couturiers and was the only company authorized to duplicate these fantastic designs. Such deals with international designers would expand, including millinery designs in 1953 and International Designer Patterns in 1956. In the 1950s, McCall’s patterns produces another designer line which included French couturier Hubert de Givenchy and Emilio Pucci. In 1958, Vogue Patterns fully transitions from perforated to printed tissue patterns. In the 1960s, McCall’s “New York Designers’ Collection Plus” featured designs from Pauline Trigere and Geoffrey Beene, among others. Starting in 1960s and continuing through 1970s, Butterick produces the “Young Designer” series, featuring designs by Betsey Johnson, John Kloss, and Mary Quant. In 1961, Butterick licensed the Vogue name and began to produce patterns under the Vogue name. Images: Vogue Spring, 1916, via hampshire-estate-finds ; vintage McCall’s printed pattern via misslacyg; Vintage Hollywood Sewing Pattern # 747 featuring Betty Grable, via ohiochestnutt; and Vogue Paris Original pattern by Nina Ricci via dalejeri. As you may recall from part two, fashion sewing patterns were still rather complicated in the mid-1800s. However, some, like Ellen Louise Demorest and her husband William Jennings Demorest, began to assist those who were interested in sewing at home — assisting at a profit, of course. By 1860, Madame Demorest’s Emporium of Fashion began advertising her patterns in magazines. This was still by-hand work, with the patterns cut to shape in two options for the consumer: purchased “flat”, which was the cut patterns folded and mailed, or, for an additional charge, “made up” which had the pattern pieces tacked into position and mailed. At this time, Madame Demorest’s Emporium of Fashion used fashion shows held in homes, along with trade cards, to promote her patterns — as well Demorest publications. In 1860, the Demorests began publishing Madame Demorest’s Mirror of Fashions, a quarterly which not only featured plates of their own dress patterns but included a pattern stapled to the inside as well. However, patterns were still only available in one size at this time. The beginning of sewing patterns as most of us know them has its roots in the winter of 1863. According to The Legend, Ellen Buttrick and her complaint were the mother of invention; but it was her husband, Ebenezer Butterick, an inventor and former tailor, who revolutionized sewing patterns and fashion history in the winter of 1863. Snowflakes drifted silently past the windowpane covering the hamlet of Sterling, Massachusetts in a blanket of white. Ellen Butterick brought out her sewing basket and spread out the contents on the big, round dining room table. From a piece of sky blue gingham, she was fashioning a dress for her baby son Howard. 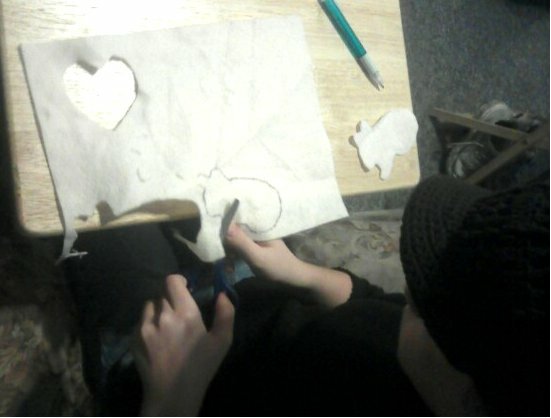 Carefully, she laid out her fabric, and using wax chalk, began drawing her design. Later that evening, Ellen remarked to her husband, a tailor, how much easier it would be if she had a pattern to go by that was the same size as her son. There were patterns that people could use as a guide, but they came in one size. The sewer had to grade (enlarge or reduce) the pattern to the size that was needed. Ebenezer considered her idea: graded patterns. The idea of patterns coming in sizes was revolutionary. By spring of the following year, Butterick had produced and graded enough patterns to package them in boxes of 100, selling them to tailors and dressmakers. These early Butterick patterns were created from cardboard. However, as most early patterns were sold by mail, heavy cardboard was not ideal for folding and shipping. Butterick experimented with other papers, including lithographed posters (printed by Currier and Ives). While these were easier to fold and ship than cardboard, they were still not ideal. Ultimately the search lead to less expensive and light-weight tissue paper. For the first three years, Butterick patterns were for clothing for men and boys; in 1866, Butterick began making women’s dress patterns. This is when the sewing pattern business really began to grow. In order to promote the mail order patterns, Butterick began publishing The Ladies Quarterly of Broadway Fashions (1867) and the monthly Metropolitan (1868). Madame Demorest’s Emporium of Fashion was still going strong, as was their publication. Although the magazine was expanded to include a lot more magazine content as Demorest’s Illustrated Monthly Magazine and Madame Demorests Mirror of Fashions in 1864. In 1865, the name was changed again, this time to Demorest’s Monthly Magazine and Demorest’s Mirror of Fashions — more commonly referred to as Demorest’s Monthly. This monthly was reaching over 100,000 readers. The success of sewing patterns could not be ignored and the competition would really begin; by 1869, James McCall started his pattern business. These early sewing patterns by Butterick, McCall’s, and Demorest were not printed, but rather outlined on the tissue paper by a series of perforated holes. They were typically sent in an envelope which had a sketch of the finished garment and brief instructions printed on it. These instructions included suitable fabric suggestions, size information, and a description of how the pieces were to be cut from the tissue and pieced together to form the garment (assisted by a code of shapes, such as v-shaped notches, circles, and squares, which were cut into the paper). In 1872, Butterick began publishing The Delineator. As with the earlier publications, The Delineator was originally intended simply to market Butterick patterns. However, it quickly expanded into a general interest magazine for women in the home, offering everything from fashion to fiction from housekeeping to social crusading (including lobbying for women’s suffrage in the early 1900s). As readership skyrocketed, the earlier publications were folded into The Delineator — and the magazine would go on to become one of the “Big Six” ladies magazines in the USA. In 1873, McCall’s would start their own publication called The Queen. In 1896, the name was changed to The Queen of Fashion and it would be the first magazine to use photographs on its cover. In 1875, the first in-store sewing pattern catalogs appeared. These were produced by Butterick. Madame Demorest was still around. In addition to marketing paper patterns through the magazines, the patterns were sold through a nationwide network of shops called Madame Demorest’s Magasins des Modes. In addition to the paper patterns and drafting systems, the shops sold ready-made fashion items, Demorest’s line of cosmetics and perfumes, and custom dressmaking services to wealthy clients. It was the latter, along with fashion exhibitions in London and Paris, which really boosted the designer and therefore the company’s profile. By the mid-1870s, there were 300 Demorest shops, employing 1,500 sales agents. Her employees were mainly women, including African-American women who received the same treatment as the white women workers. In 1877, business was peaking. The Demorest’s Monthly began circulation in London and, along with the quarterly, the company began publishing Madame Demorest’s What to Wear and How to Make It. Just a few years later, however, Demorest business declined. This was unfortunately do to the Demorests’ failure to patent their patterns, allowing themselves to be bested by competition. In 1887, Demorest sold their pattern business, which went on to live on primarily in name only — including sewing machines. Image of Mme. Demorest Hilda Polonaise Pattern via dakotanyankee; image of 1899 Butterick Pattern Ladies Double Breasted Coat via janyce_hill. As we left things at the end of part one, we were moving into the early 19th century and taking a closer look at how clothing pattern history closely parallels domestic sewing machine history. In the early 19th century, sewing machines were not only impractical and complicated, but seen as threats. In 1830, for example, another French tailor, Barthelemy Thimonnier, found himself thwarted by another group of French tailors — this time, the tailors were so fearful of unemployment that they burned down Thimonnier’s garment factory. Four years later, American Walter Hunt would build a sewing machine; but he did not follow through on the patenting of his invention because he too feared his invention would cause unemployment. Early 19th century paper patterns, while apparently less economically feared than sewing machines, were so complicated and off-putting as to be considered fearful themselves. These early 19th century patterns had all the pieces of a garment superimposed on one large sheet of paper. This meant that each piece was coded with specific lines, in different patterns (straight lines, dotted lines, scalloped lines, broken dash-like lines, and even combinations of these; sometimes all in the same color). To make matters worse, multiple garments were often on the same page! To make use of this map of crisscrossed patterned lines, one had to place a plain piece of paper beneath the paper pattern and use a tracing wheel to follow the (hopefully correct!) lines to make a separate pattern for each pattern piece. Even after all of this, the person attempting to make the garment was still not done. As these patterns were sold in a “one size fits all” sort of mentality, it was up to the seamstress or housewife to measure and grade (enlarge or reduce) each piece to fit the individual who would be wearing the garment. Make any mistakes along the way, and you would have wasted the fabric and your time. Perhaps ruined the pattern as well. 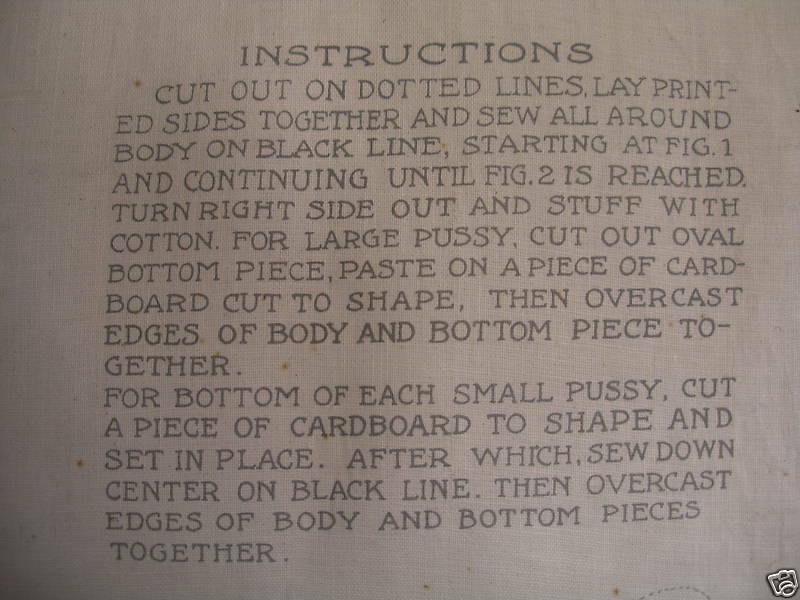 No wonder these early sewing patterns weren’t wildly popular. The housewife with free time in the afternoon was far more likely to spend it at the family sewing machine than in making social calls. 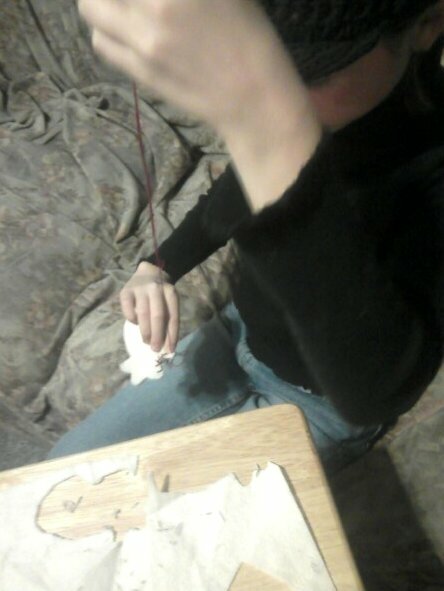 For the first time, it was possible to make a man’s shirt in just over an hour where before it would have taken 14 1/2 hours by hand; or to make herself a chemise in less than an hour instead of the 10 1/2 hour hand-sewing job. No wonder the middle-class married woman welcomes the domestic sewing machine with such enthusiasm! …However, considering how complicated fashionable dresses for women were, it is probable that most housewives, even those who had to watch their expenditures, did not have the talent for mastering complex dress construction; they would continue to call in a dressmaker for their more elaborate clothing. Still, sewing on a machine, like the art of cooking, was a learned skill that gave the middle-class matron both pleasure and a feeling of professional competence — job satisfaction in a sphere where a sense of inadequacy was too often the norm. No doubt this was all equally true of women in America too. While the upper classes may have frowned upon use of the sewing machine (for everything from the potential decline in the art of hand-stitching to the encroachment upon upper-class fashion looks), and purse-string-controlling husbands may have resisted investing in arguably the the first labor-saving device for the home (why would any self-respecting husband spend money on something his mother had done for free — besides, women were incapable of operating complex machinery! ), middle-class women themselves ushered in the era of the sewing machine. With a little help from Isaac Singer. Singer’s first consumer or domestic sewing machine, the Turtle Back (named for the large container the machine came in), sold for $125 — at a time when the average household income for a year was $500. To overcome objections, Singer introduced America and the rest of the world to installment payments. The marketing combination of “small monthly payments” along with demonstrations offering free instruction with each machine proved irresistible. While sewing itself dates back thousands of years, to the Paleolithic period, patterns for making clothing are a much more modern invention. The earliest known fashion patterns, dating to ancient Egypt, were relatively simple guide templates cut from slate. (Similar slate guides, presumed to the products of trade, have also been found in ancient Roman catacombs.) However, for the most part early human history, clothing was primarily constructed from rectangular shaped pieces of uncut woven fabric. The fabric, so labor intensive to produce and therefore costly to purchase, was primarily left intact to minimize waste. At this time, the wearer was almost always the maker of his own clothes. The cloth itself, not the shape or design of the garment, was the distinguishing feature. However, by the year 1297 the first reference to the word “tailor” is used in Europe. This would indicate that pattern making must have begun at some point prior, as tailoring involves the acts (or arts) of cutting and sewing cloth — the two basic aspects of constructing clothing from a pattern. Also in the 13th century, a French tailor attempted to make patterns from thin pieces of wood. However, this tailor’s invention was thwarted by the powerful Tailor’s Guild whose members feared such an invention would put them out of business. According to Principles of Flat Pattern Design by Nora MacDonald, the real art of pattern making wouldn’t begin until the 15th century. This is the result of two pivotal historical moments: the Renaissance, and the movement’s desire to dress to accentuate the human form, and Gutenberg’s printing press. The former meant that carefully engineered pieces of fabric were cut to form clothing which would contour to the body. The latter meant that images of clothing designs could be more widely disseminated. So, now when the wealthy had their new form-fitting frocks, the little people could all see images of them — even if they had never been to the big cities, let alone court. As countries grew in power (first Italy, then Spain and France), so they influenced others. And what they were wearing was a large part of that influence. Fashion was truly born. The fashions of these times continued to be made by tailors. The process was elaborate, with tailors working with each client’s to take their individual measurements to customize and even create patterns. Such highly revered skills meant that the services of tailors were relegated only to the very rich. This continued to be the case through the Industrial Revolution. For those who could not afford a tailor of their own, staying fashionable was laborious. While the publications of the day (such as Godey’s Lady’s Book & Magazine, The Young Ladies Journal, and Peterson’s Ladies National Magazine), depicted the latest fashion designs, the accompanying text was more like a flowery description than a set of step-by-step instructions. Your average household, relying upon the lady of the house and her daughter(s) to make the clothing, struggled to make use of the fashion lithographs provided. Rarely were diagrams provided; and no measurements were given. Even when one was talented enough to make the required calculations, all the sewing was done by hand — and the sewing was typically done after more vital and immediate work was performed. By the time your dress was finished, it really could be out of fashion. The Industrial Revolution brought along a host of advances which greatly increased the standard of living for “the masses”. This included less expensive textiles and an even greater desire for fashions — naturally spurring advances in the fashion industry. As we reach the early 19th century, clothing pattern history closely parallels domestic sewing machine history. 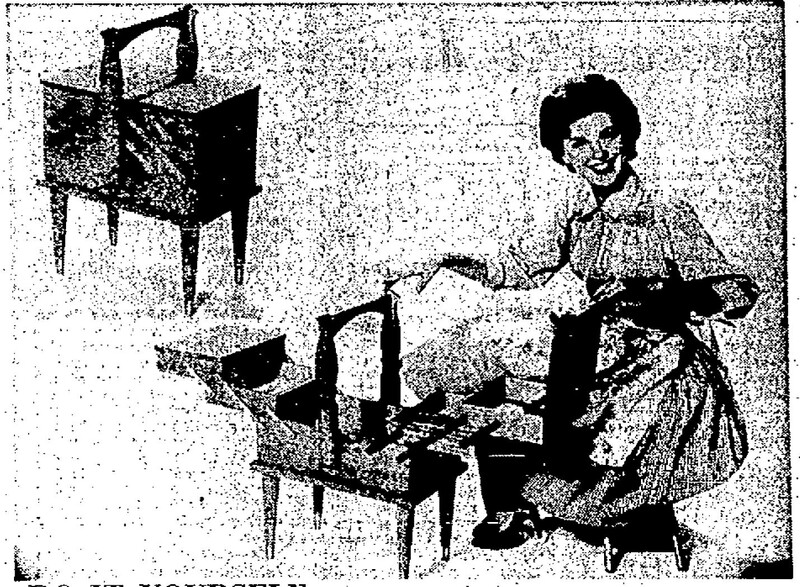 The photo of Jan Norris (of NBC’s It’s A Man’s World television show) was featured above an article promoting patterns for making this folding sewing cabinet and other sewing boxes. Unfortunately, the microfilm copy isn’t very clear; but you can still get the idea. 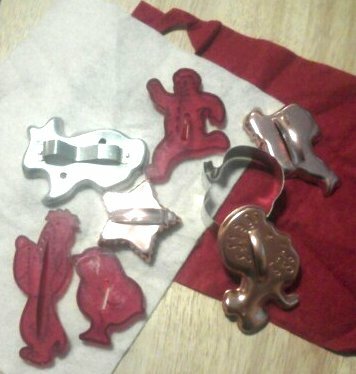 I shared this at my other blog, Things Your Grandmother Knew, but I figured those who collect cookie cutters might be like me, always looking for ways to put them to good use — when not baking. Because most of my cookie cutters are vintage, I’m still protective of them and am not interested in altering or damaging them; yet their simple & charming shapes seem to beckon to be put to use more often then just to make sweet treats. 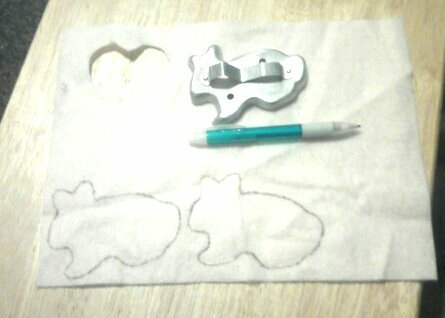 #1 Trace the cookie cutter onto felt with a pen — twice. 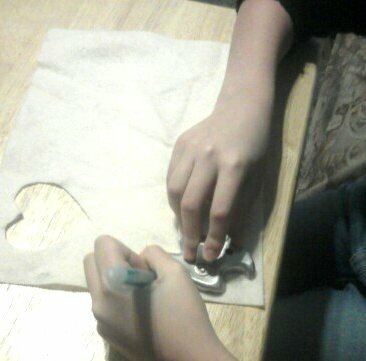 #2 Cut out the shapes. 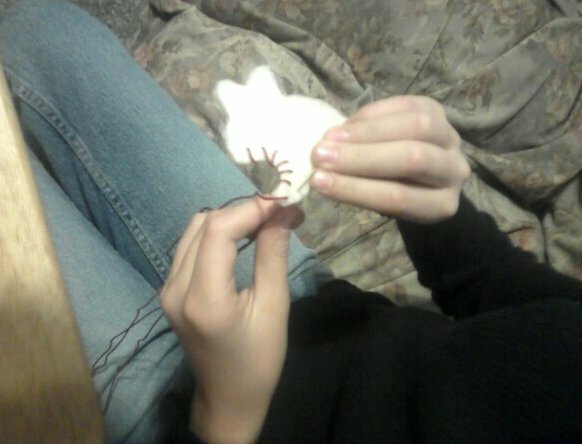 #3 Match up the shapes, then sew them together with embroidery floss using the whip stitch. 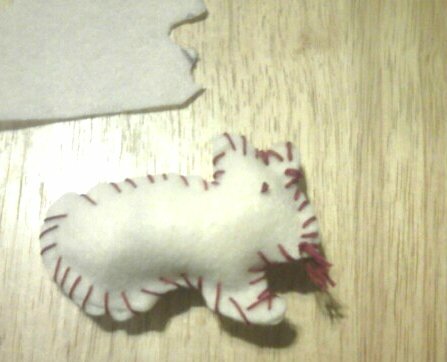 Start stitching between the two layers of felt, hiding the knot; and stop before stitching all the way around, leaving an opening for the stuffing. 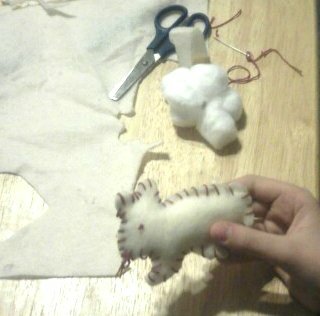 #4 Stuff with cotton balls (as well as felt scraps from cutting & trimming and left over bits of thread). #5 Finish sewing & then decorate. Children can make the eyes & other details by sewing on other bits of felt, using knots &/or other sewing stitches, or gluing on ‘google eyes’, pipe cleaners, and whatever other crafty bits you have around the house. Voila! You have handmade family heirlooms! Other ideas: These do not need to only be Christmas tree ornaments or holiday decorations. They can be shade pulls, key rings, jacket pulls, cellphone &/or purse decorations. If made with just one piece of felt, glue magnets onto the backs and use them to hold up notes and more kids’ art on the refrigerator. 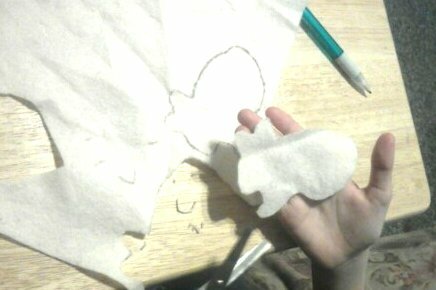 The felt shapes also can be used as appliques for patches on clothing, to make pins, or for more complicated sewing projects. Who knows what ideas you and your kids will come up with? It’s inexpensive too. Felt pieces are (currently at Hobby Lobby) 5 pieces for $1 for solid colors and 2 for $1 for patterned pieces; embroidery floss runs between $1-$2. Everything else (scissors, cotton balls, needle etc.) can be found in the home. It’s a great simple and inexpensive way to have children make gifts for family and friends, keep them busy and creative on days off from school (and away from video games etc.) 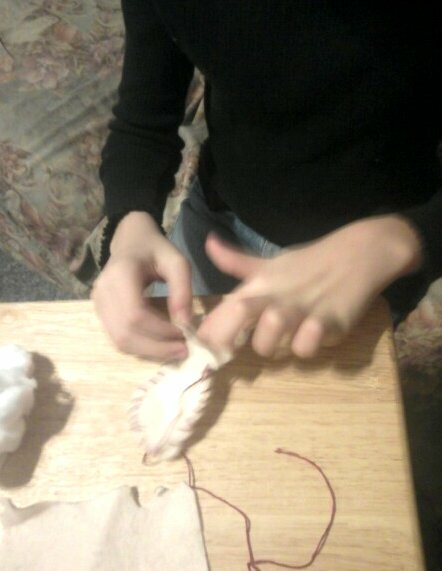 as well as to teach them to sew. Sweet Pink Kitty Paws – It’s Saalfield Oilcloth! 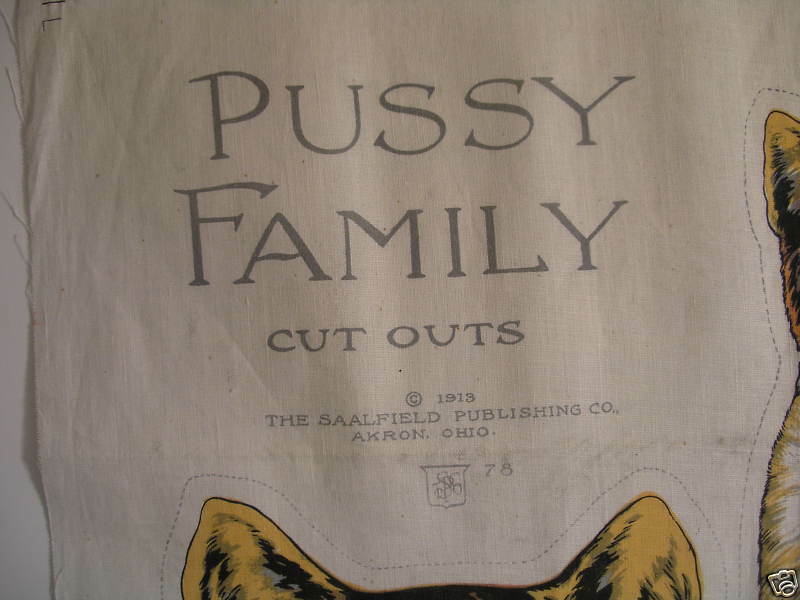 I’ve seen and sold a number of items from Saalfield Publishing Co., Akron, Ohio, before, but I’ve never seen anything like this uncut oil cloth with cats printed on it dated 1913. The entire sheet of oilcloth measures 36 and 1/2 inches by 24 and 1/4 inches. It has three cats which are to be stuffed with cotton. Two are sitting (the largest is 17 inches tall, the other 9 and 1/4 inches tall), and the third is laying down (measuring 9 inches long). The largest one sits on the oval piece (a cardboard insert is to be added to stabilize it). I love-love–love the tiny pink kitty paws! 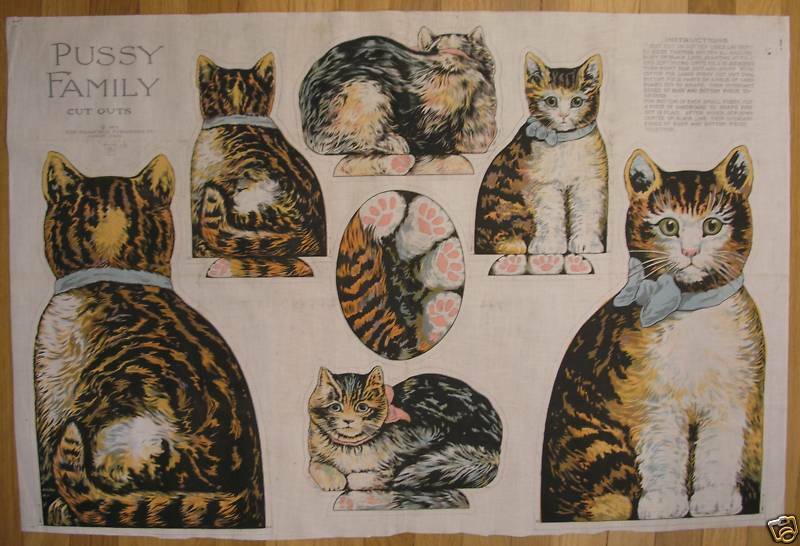 Complete instructions for making the family of kitties are printed on the fabric. The question is, would you even dare to cut it? The charming antique oilcloth (available for sale at and images via kouleegirl ) opens a whole new possibility for me in collecting Saalfield things — something I’ve not seriously collected yet. Yet. Things like this get me excited! So I plan to spend some more time studying the collection at Kent University, where they have a nice Saalfield Publishing Company collection (1899 – 1976). The collection includes artwork, oversize galleys, printing plates, etc., catalogs, and publications from 1899 – 1976. Or you can view lists of the collection’s holdings by series (linen books, paper dolls, activity books, etc.). Sadly, Kent does not have any images from the Saalfield Collection online; but fans can check the university’s FAQ on the collection for more information. 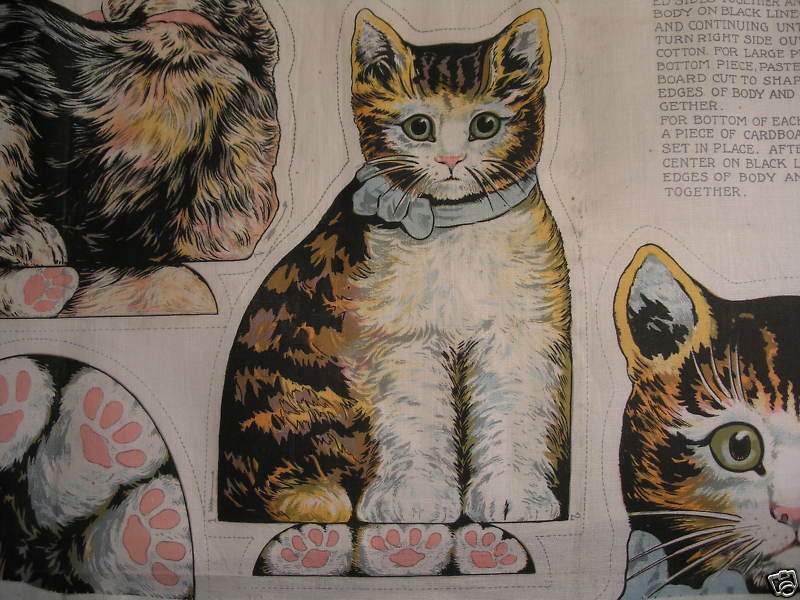 Posted on January 28, 2010 January 28, 2010 Author DeannaCategories Crafts, Sewing & NeedleworkTags antiques, cats and kittens, collectibles, collecting, sewing patterns, stuffed animals, textiles1 Comment on Sweet Pink Kitty Paws – It’s Saalfield Oilcloth! Many people think of aprons as charming relics from our past, or as evidence of enforced domesticity; but the truth is, aprons have a practical role in modern lives too. Grandma always said you should be proud of your work around the house; you should be proud to take care of your home and family, and dress to show that pride. While grandma was a lady who liked to dress up, she wasn’t the June Cleaver type who wore pearls while scrubbing out the oven or baking cookies (even at holiday time). But she still believed in being properly & attractively dressed for housework. One of the staples grandma recommended, naturally, was the apron; and she taught me a lot about them. Sure, they can be absolutely adorable and therefore bring a smile to your face, but they are incredibly practical. Even the frilly aprons, traditionally called hostess aprons were practical; worn for show, they still offered a place for the hostess to wipe her hands while serving guests. 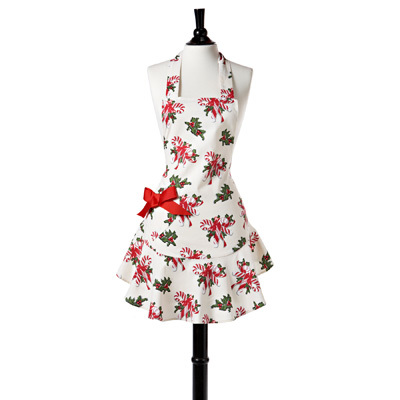 Heck, making aprons even had the advantages of teaching and improving sewing skills. But aprons are more than practical and/or fun. As my grandmother taught me, aprons are worn with pride to show pride. You should care enough about your clothes to want to protect them, yes; but you should also care enough about yourself to feel good, clean & pretty in a good, clean & pretty apron. So change your apron often, wash it often, and once it’s served it’s usefulness — including as an attractive garment — stop wearing it. As for vintage aprons, feel free to wear them — but treat them well. Many vintage handmade aprons are like works of art (at least for those who wouldn’t know how to even sew the pocket on). Avoid washing them in wash machines, or, if you must, at least on the gentle cycle; and let them hang to air dry. While my grandma taught me a lot about aprons and the values they held, I don’t own any of her aprons… When I buy and hold vintage aprons, I like feeling that connection to my grandma and all the other women who worked to make the aprons, make the meals, make the memories — collecting them makes me feel tied to all their apron strings.